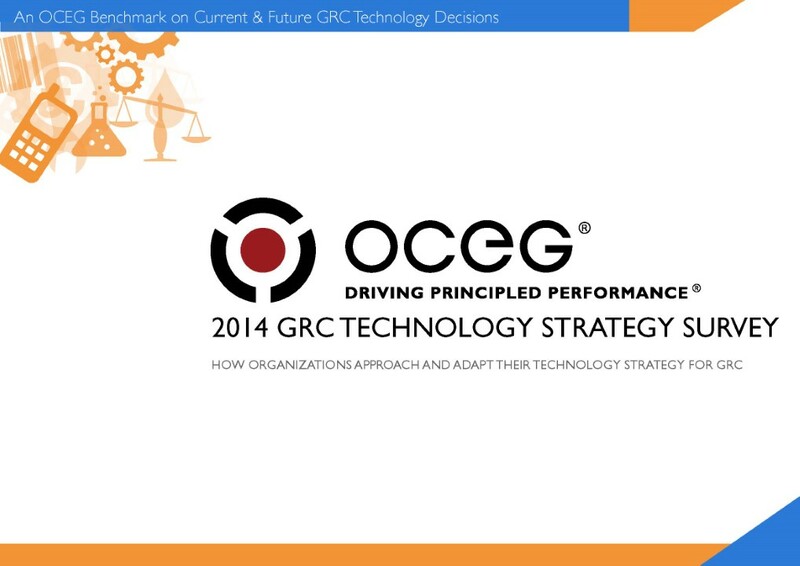 An OCEG Benchmark on Current &#38; Future GRC Technology Decisions. The post 2014 GRC Technology Strategy Survey Report appeared first on OCEG . An OCEG Benchmark on Current & Future GRC Technology Decisions. Holistic perspectives from risk managers, internal auditors, compliance & ethics officers, and others. How effectively are companies utilizing GRC technologies? What benefits and outcomes does GRC technology provide? What are your peers planning in GRC technology purchases or improvements? The survey was developed by the members of the OCEG GRC Solutions Council. The post 2014 GRC Technology Strategy Survey Report appeared first on OCEG. We have emailed instructions to access 2014 GRC Technology Strategy Survey Report to . Make sure the email arrives in your inbox: either add "support@oceg.org" as a safe sender to your email platform, or if you use Gmail, drag our email into your Primary tab.